With millions of shoppers carrying around ever more powerful smartphones, it’s probably inevitable that savvy retailers will start pumping coupons, deals, and other enticements directly to the screens in our pockets and purses. But truly intelligent in-store digital ads, especially ones tied to your location in the aisles, aren’t quite here yet—even though plenty of companies big and small would love to get a piece of the action. That’s where Boston-based Swirl is hoping to make a dent, and now it’s got some more fuel in the tank. Today, Swirl is announcing a new $8 million investment round led by Hearst Ventures, the investment arm of the media and advertising giant Hearst Corp. Previous investors SoftBank Capital and Longworth Venture Partners also chipped in. 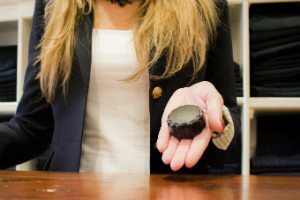 The startup has developed hockey puck-sized, battery-powered beacons that can be placed throughout a store, creating a concentrated sensor network that tracks shoppers who opt in with a smartphone app. Retailers can then use Swirl’s software to send digital coupons to those shoppers, even customizing the deal based on the buyer’s identity, purchase history, and other data. Swirl’s beacons use Bluetooth Low Energy, a lighter-weight version of the communication radios often used to connect a smartphone to a headset or external speaker. As the name implies, Bluetooth Low Energy uses less power to transmit its radio signals, helping conserve battery life. But the technology also can transmit data at distances from two feet to 600 feet, Ozguc says, making it ideal for an indoor network. And perhaps more importantly, Bluetooth Low Energy also is being embraced by the important players in smartphone devices and operating systems. Apple has supported the technology since the iPhone 4S, Ozguc says, and recently gave its tracking options a boost by including a feature called iBeacon in iOS 7. The Google-owned Android operating system also has started supporting the technology, as do the newer generations of handsets from Android leader Samsung. “The pieces are now falling into place,” Ozguc says. Swirl, which closed a $6 million funding round at the beginning of 2012, started testing its technology with a range of fashion and apparel retailers in Boston and New York, including Timberland, Kenneth Cole, and jewelry seller Alex and Ani. Ozguc says the tests showed very good results, with three-quarters of shoppers clicking on the deals they were presented and half of them actually cashing in the savings. Now, the company is hoping to expand by getting its systems placed in major “big-box” retailers. And realizing that retailers want to control the relationship with shoppers, Swirl is focusing on providing its technology as a “white-label” service that store owners can trick out with all of their own brands and labels. “Our whole system is really designed for large retailers that need to put dozens, if not hundreds of these into their store and need to manage them,” Ozguc says. A worthy goal for anyone trying to cash in on the almighty American consumer. With investment cash and ties to Hearst, Swirl has graduated to the next phases of this competition, which seems to be far from over.